The Pont des Arts is a pedestrian bridge which crosses the Seine River however, it is more famously known for being the place where you show your undying love and affection to your partner. 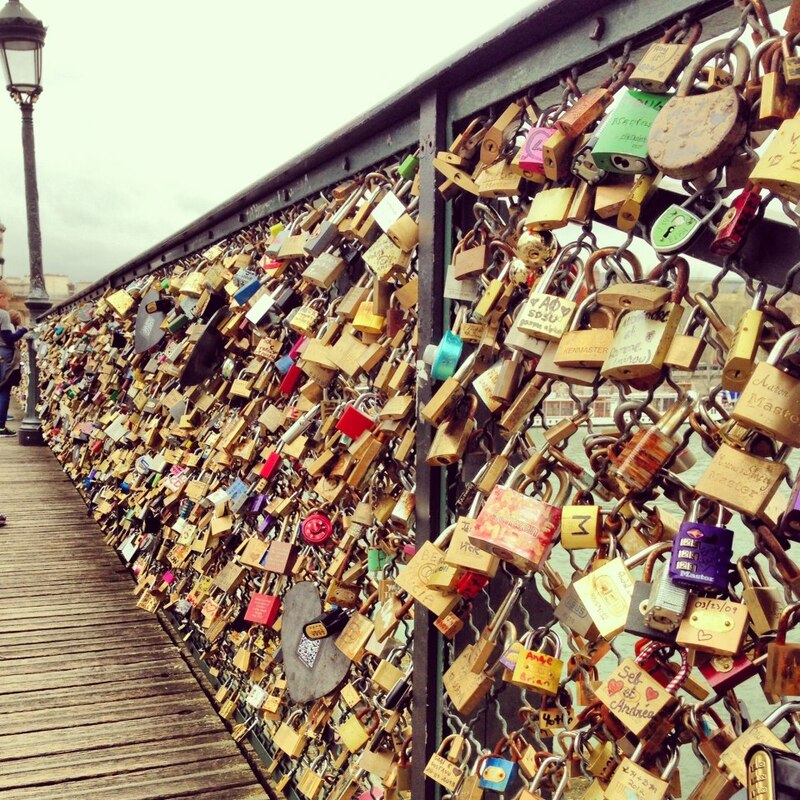 Lovers will put a personalized lock on the bridge and throw the key into the river Seine as a sign of their eternal love. I’ve checked out some of the locks and it really is amazing as to how creative people can get. Some had inscriptions of their initials while other even have a short quote about love. I don’t consider myself as a romantic but I like the idea and the symbolism of the act. Eternal love shown thru a padlock which will never be unlocked, ever. I feel romance all around me when I was there. Well actually you can feel it everywhere if you’re in Paris but I really do believe that the Pont des Arts is the most romantic spot of Paris. 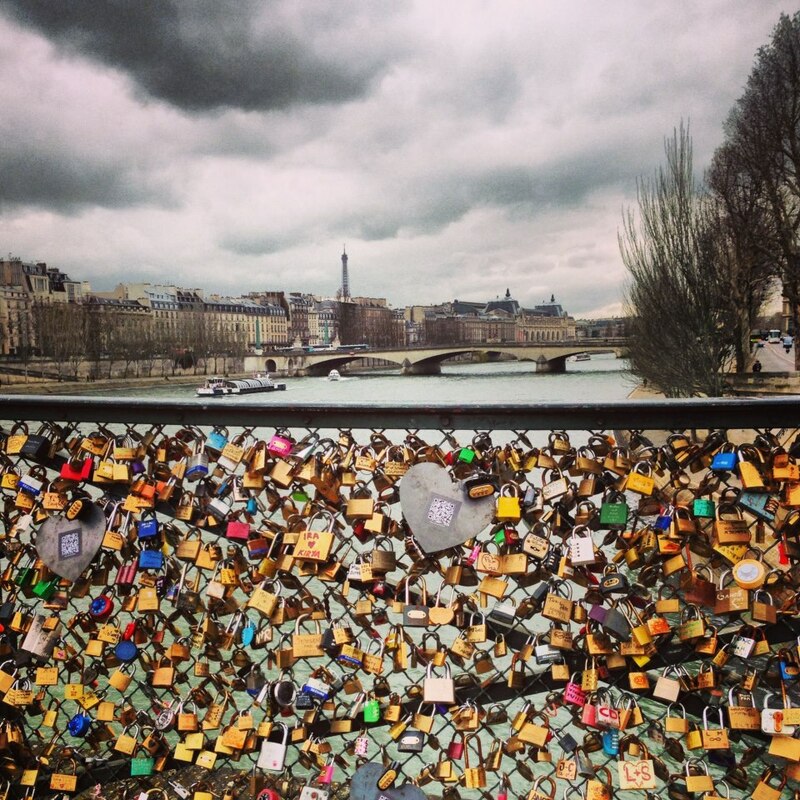 Apart from all the love locks surrounding you and the lovers amorously looking into each other’s eyes as a bateaux cruise crosses the river underneath them, it is the bridge’s perfect location which makes it all the more romantic. If you stand in the middle of the bridge, you will have a 360 view of the whole of Paris. It’s much lovelier at night with the Eiffel tower glittering from the horizon and the Notre Dame on the other side. Romance in Paris is real, it’s not staged nor fake. It’s the lights, it’s the architecture, it’s the air (yes, even if it sometimes smell like dog poop), it’s the trees, it’s the river bank, it’s the smell of a fresh baguette, it’s the sound of the French words – it’s everything of Paris. It’s romantic. What happens though if the lovers broke up? I guess one of them goes back to the bridge with a chainsaw or something in the middle of the night. If they’re smart though, they would have kept a spare key just in case. LOL. Things To Do in Paris: Enjoy the nightlife in Bastille. I would love to go there one day if I ever meet that special someone 🙂 I heard about a similar place in Italy if I’m not mistaken. Or maybe it was this. I don’t remember, it was in a forwarded chain mail a long time ago. A spare key?? You’re such a party pooper, Pinay. Things To Do in Paris: Visit Sacre Coeur. Things To Do in Paris: Take a day tour to Bruges.